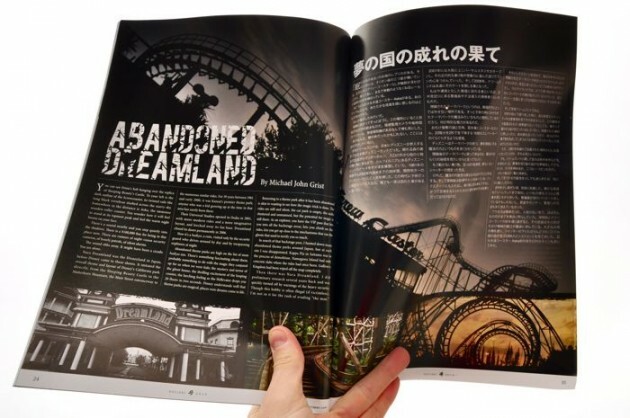 The Nov/Dec edition of Outdoor Japan features an article with photos by me about Nara Dreamland. I wrote about it on my site here, but the version I wrote for OJ was quite different, emphasizing the adventure, tension, and exhaustion much more. It’s always great to see your work in print, especially with photos. They did a beautiful job with the layout- using the silhouette parts of the Corkscrew ride for text. I’m really pleased. This page on the OJ site tells you where you can pick up your copy of the magazine. Thanks Mike, and yes, it’s always a concern that increased exposure will up the difficulty for later explorers. I had the same thoughts after your Gunkanjima coverage proved so popular. Oh well, looks like it’s goodbye for anyone else who wanted to get in now. I don’t see your point, drteeth. 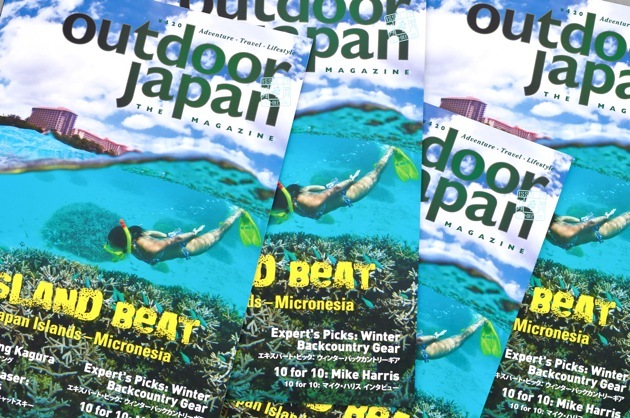 There are many magazine articles and books and websites and maps out there on just about all the haikyo locations in Japan. You think whoever runs Dreamland now is reading a small press magazine primarily targeted at English speakers, and will take it more seriously than the dozens (likely hundreds) of articles written about the place in Japanese already? Come on. If you want to attack someone, go after the folks who’ve printed maps to these places in books. But remember, without someone going there before us and making it known to us somehow, we wouldn’t know about these places in the first place. If you’re referring to Nippon no Haikyo ??????? then the maps argument doesn’t hold much water to be fair. The book is infamous in urbex circles for maps of near comical ambiguity. What is rather interesting is that whilst most readers write them off as a half-arsed job, to be it seems clear the level of abiguity is intentionally set. For a site like Dreamland, they’d put a single dot on a prefectural outlione for example (like they did with the ones in Mito, or one amazingly delicvate site in central Japan). For mid risk ones, they zoom in to city ??? level and pop on one or two basic features. I know the book receives a lot of flak for those maps, either for being too crap, or too spoilerific, but to me, this seems a fair way to go about it. The site’s existence is documented — a dedicated explorer can still go find it — but some level of secrecy is met to ensure it doesn’t get utterly trampled. And that secrecy is tiered logically: how utterly Japanese. As for “well, we wouldn’t know about these places”, most seem to be found by local urbexers pouring through bankruptcy records, or people with cars trawling the countryside tirelessly (think Team Haikyo in Gifu). Even a scan of the horizon from a high building or Google Earth could net you that rare virgin find. Plus some stem out of legends and word of mouth. For example, theres an abandoned themepark in Tokyo (mostly stripped to foundations) that I heard about from a friend who recalled it from her youth! Similarly, I can think of at least one big possible explore still untouched in Japan that stems from urban myth and legend (I’ve heard theres a guy now actively researching that one). But most of those methods will only net you local sites. As such, it’s an issue of balance, sharing _is_ good as it let’s you do more explores further afar, but must be tackled cautiously. I wouldn’t be so hasty to adamantly claim a niche book will have greater effect than a glossy article, especially given the rep of the “caretakers” of this particular site. Please be careful. I take it back, you have a point. Heat of the moment and all that. Haiykos seem to be getting torn down at a much faster rate these days sadly. I’ve been in Japan for over 8 years, the beginning of that was the “golden age” I suppose for exploring. By the way, I’m pretty sure Daiei ( you know that cheapo supermarket chain ) own Nara Dreamland/ the actual land.